I’ve been using Microsoft Project Siena (beta) for rapid app development and am really excited about the possibilities this tool holds for the future. Project Siena is a truly visual tool that lets you visually construct apps and bind data in the background so you can design and preview in real time from a single interface. It’s a whole lot easier than coding in Blend or Visual Studio, and a whole lot faster. 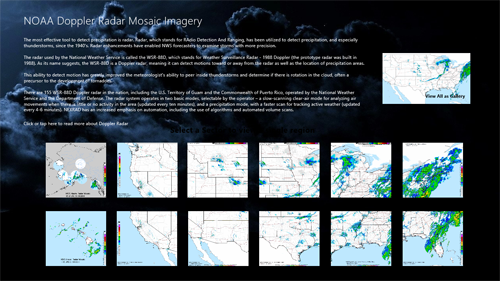 A week or so ago, I decided to build an app that displayed the real time available Doppler Mosaic animated images from NOAA, with a future goal of adding the individual 155+ individual stations in the USA. I sat down over the past weekend and added the individual stations, by sector. 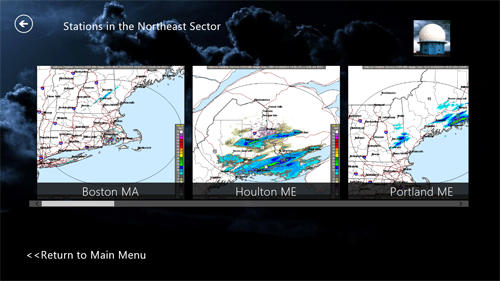 Release 3 of my NOAA Doppler Radar Mosaic Imagery app is now available in the Windows Store. It was a lot easier to add the individual stations that I thought it would be. I had to massage some data from NOAA, create some Excel tables and set up some galleries. Finding the animated images and creating the Excel workbooks was actually the most time consuming part of the project. Once I had decided on how I wanted to display the data (images), actually building this out took very little time. So what’s in my major update? For readability/usability, I changed the background graphic. Should be far easier to read any text in the app. OK, that isn’t so major. 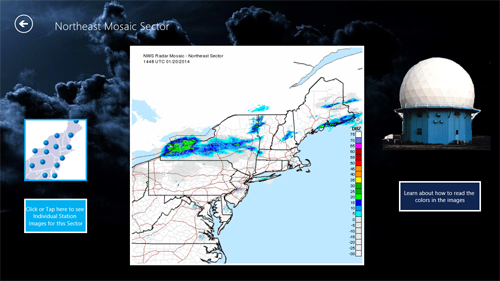 What IS major is that I added all available 155+ local Doppler stations and current animations to each applicable mosaic sector, displayable as a gallery. Below is the Northeast Mosaic Sector display. So from each individual sector, simply select either the pushpin map on the left or the text below it. The stations in the Northeast sector (or for whichever of the 12 sectors you display) are presented in a scrollable format so that you can visualize the details. City names are also shown, making it easier to understand. NOAA refreshes the images every 4-10 minutes, so each time you launch the app, you will see a nearly real time animated Doppler radar display.